Guide Emily on a romantic journey in her search for happiness. "If you are a fan of the Emily games, this one will not disappoint you. It has a cute story and plenty of levels to get through. Lots of different family members and other visitors add to the interest of the game. It is quite easy in the first few levels and gradually gets harder and more challenging, which is great." Emily's restaurant continues to thrive though her personal life is completely non-existent. Shades of promise appear when she receives a rose, but she is too shy to act on it. Then one day an old love letter from a summer romance arrives that turns Emily's world upside down. Will she act upon either of these to find her true love? 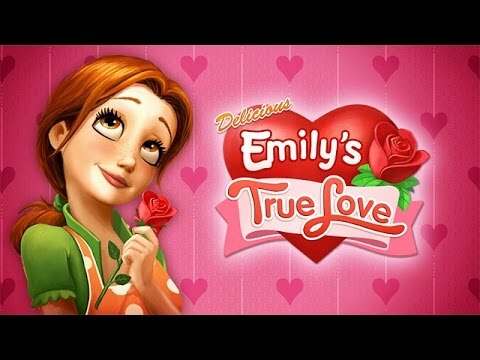 With exhilarating tasks, endearing surprises, rewarding trophies, and fabulous upgrades, Delicious: Emily's True Love is destined to become your favorite. This is a really a great game. If you enjoy the Delicious Emily series, you will love it. I also recommend the Hearts Medicine series to fans of Delicious. Its by the same creator and just as fun. I'll admit it. I'm addicted to time management games. It's even better because it has a story. I thought it was really cute, and the dishes are challenging because there are many steps to them. Simply put, I enjoyed this game for its plot and the mostly realistic ways in which Emily travels to various parts of the world. She is still finding ways to show off her cooking skills and helping bring people together. The ending is as delicious as some of that food! I love all of Emily's games. Some episodes are quite easy, but then you encounter one that has to be re-tried over and over before you attain top marks and find the pesky mouse. Keep on bringing out new Emily games. I have all the Delicious Emily games and each one is really fun. I have been playing them for years and still go back to her oldest ones! I enjoy Time Management games but by far the cooking ones are the most fun. The Emily ones are the best! You can really see the improvement over the years in game play and features. I love all the Delicious Emily games and would play them all day too. Keep up the good work GameFools! I love your game site and the games on it. This was a great Time Management game. It had good graphics and a really good story line. I also like the kitty that was in the game and the variety of countries Emily ended up in.